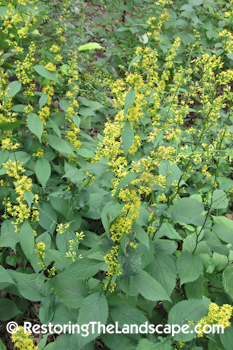 Zigzag Goldenrod is in full bloom right now. A common Goldenrod of woodlands and openings, it is one of the most shade tolerant species of Goldenrod. 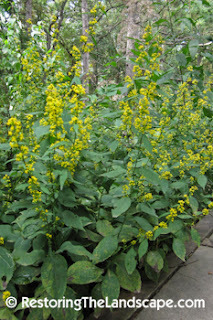 I especially like it for its shade tolerance and ability to thrive in dry sandy soils. It brightens any corner of a woodland in the fall. The common name Zigzag is for its crooked flowers stems which alternate back and forth in a zig-zag pattern. 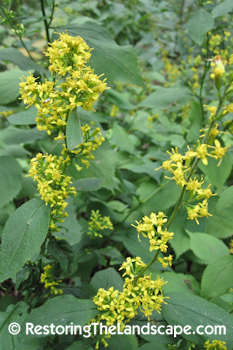 From these leaf axils, a cluster of bright yellow flower heads emerge. Another great feature of this native perennial is that it spreads by rhizomes, forming a nice cluster or colony. Zigzag Goldenrod reaches heights of 2-3 feet. It is on the tall side this year in our area due to the significant amount of rainfall earlier in the season. Its form is very upright and linear, so it contrasts well with softer textured woodland plants. Flowering starts in late August or early September continuing on into early October. The resulting seeds have tufts of hair which allows for good wind dispersal. 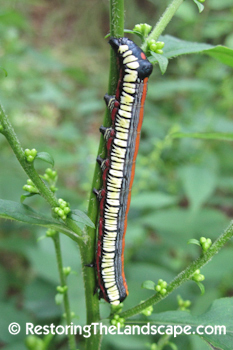 Zigzag Goldenrod is a larval host plant for the Brown Hooded Owlet Moth caterpillar (Cucullia convexipenis) which feeds on the plant in early to mid August. 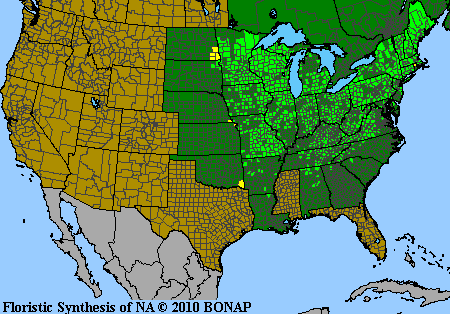 Zigzag Goldenrod is native to eastern North America, see map below for range.